National Parks are natural areas of great ecological and cultural value, little altered by human activity and exploitation and which due to the beauty of its landscapes, the particularity of their ecosystems and the unique features of its flora, fauna or their geology deserve particular attention and are proclaimed general interest of the State. In Andalusia there are two extraordinary National Parks, which are the Sierra Nevada and Doñana. In addition, there are in the Andalusian region a total of 22 Natural Parks and 9 Biosphere Reserves. Therefore, the Protected Natural Areas in Andalusia comprise approximately 2.8 million hectares, equivalent to 30.5% of the area of Andalusia. 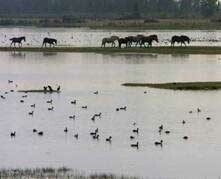 Doñana National Park is the most important wetlands in Europe. It is located in southwestern Spain, in Andalusia, in the provinces of Huelva and Seville. Doñana is a composition of different landscapes where coexist a wide range of species of plants and animals. Its size and strategic location make this natural area an important wintering place for migratory birds. In early autumn and winter you can enjoy the presence of thousands of waterfowl from northern Europe. In spring and summer come from Africa among other species storks, herons and swallows, for food and a milder climate. 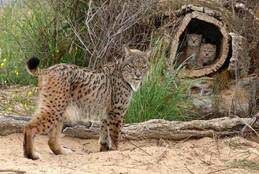 In the vicinity of Doñana there are extensive pine forests which provide a favorable environment for the Iberian lynx and some birds of prey, such as the imperial eagle. On the coast you can visit the magnificent Cliffs of Asperillo, a declared Natural Monument for its uniqueness and beauty. Throughout the National Park there are several visitor centers with exhibitions and walking paths of great beauty. There are marked trails and also guided tours. There is also a Marine Museum in Matalascañas and the Religious Museum in El Rocio. At the entrance of the National Park are available parking, toilets, children's play area, public telephone, public-use sources and shelters. Visitor´s Centers are located in Matalascañas and El Rocio (Almonte), in Aznalcázar (Seville) and Sanlucar de Barrameda (Cadiz). Seville airport is situated 150 km away, Malaga airport 188 km and Huelva Railway Station 50 km. There are regular buses to Matalascañas. Doñana National Park is visited all year, but receives a significant number of visitors during the summer months and spring. The Sierra Nevada National Park is located in the south of the Iberian Peninsula, in Andalusia, south-east of the city of Granada and also includes the western part of the province of Almeria. The Natural Area Sierra Nevada is a vast mountain range with the highest peak in the Iberian Peninsula, the Mulhacén, with 3.482 meters. Apart from being National Park, Sierra Nevada is also recognized as the biggest Biosphere Reserve in Europe. Climatic variation and the large difference in altitudes have facilitated the growth of a large number of plants suited to the difficult conditions. In the high mountains there are wonderful glacial valleys like Siete Lagunas. At medium altitude there are abundant deciduous forests consisting of Pyrenean oak, maple, cherry and chestnut trees, which in autumn delight the eye with a vibrant range of colors typical of Nordic countries. With this wide range of vegetation and climate there is also a great faunal richness, as the golden eagle, wild boar, fox, badger, mountain goats and many species of butterflies. The National Park Sierra Nevada has developed an important tourist industry for lovers of skiing, mountaineering and trekking. There are visitor's centers in Guejar Sierra (Granada) and Pampaneira (Alpujarra). There are both marked routes and guided tours of the Sierra Nevada National Park. At the entrance to the park are available public parking, toilets and public telephones. There are a total of three atended shelters: The Refugio del Poqueíra at 2,000 metres (Trevelez), the Refugio Postero Alto at 1,880 metres (Jerez de Marquesado) and Refugio Puerto de la Ragua at 2,000 metres (Marquesado de Zenete). Granada is a well connected city with a modern network of highways and four airports nearby: Granada Airport at 15 km, Málaga airport at 150 km, Seville airport at 250 km and Almeria airport at 200 km. The strong development of tourism in the ski resort Sierra Nevada has contributed in recent years to plans for expansion. Subsequent to the declaration as a National Park, this possibility has now been rejected, although there is pressure from political and business sectors. Travelling through Andalusia outside the traditional tourist circuit can be a unique experience, but does not have as many amenities as the coastal route: there aren't as many service stations or stores, and opening hours are shorter. Therefore it is desirable to have some basics on hand such as water, mobile phone, and a GPS unit or maps of the area. Some car hire companies equip their vehicles with GPS systems, including cheap car rental companies.